Do you need to make a payment because your account has gotten a bit behind or do you just need to change your payment method? If so, you are in the right place. You can update your payment information directly from your Akismet account page. Note: To access your Akismet account you need to log into your WordPress.com account. 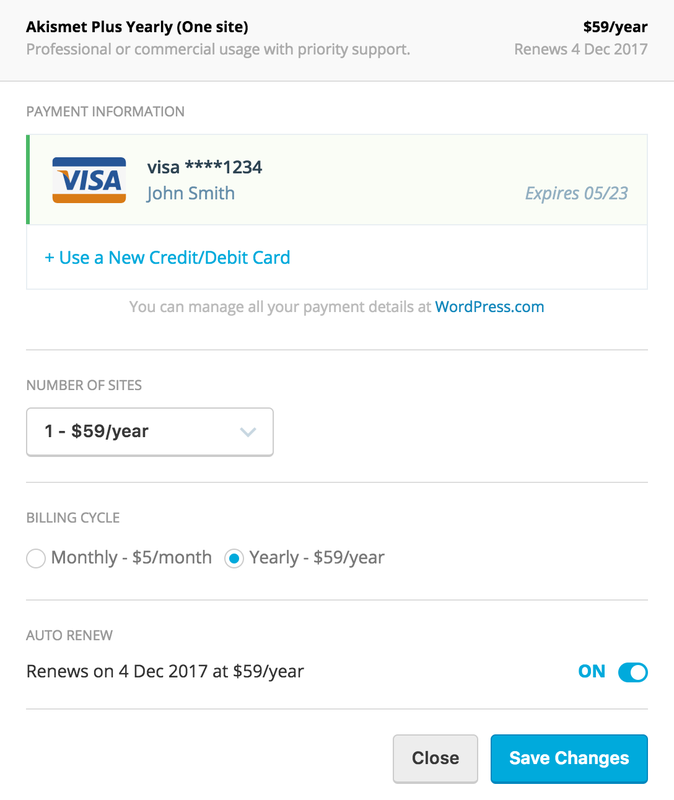 If you have an Akismet subscription then you have a WordPress.com account as one was created when the Akismet account was created. It is the same login information you use to sign into Akismet.com. Then you will be taken to a screen that will allow you to update your payment method by clicking on +Use a New Credit/Debit Card. On this screen, you’ll also be able to change the number of sites that your current subscription supports, your billing cycle, and turn the auto-renewal on or off. Am I able to receive a refund? How do I add more sites to an existing subscription? How do I change my Akismet plan?